Auscript is proud to have been a major sponsor of today’s Legal profession White Ribbon Day breakfast at Brisbane City Hall, featuring a keynote address by esteemed journalist and human rights advocate Tara Moss and Magistrate Colin Strofield of the Southport Specialist Domestic Violence Court. The event was in support of White Ribbon Day – the national day to end violence against women and children – and raised more than $100,000 for the Women’s Legal Service. Auscript General Manager Kate Gaske said the Company was committed to working with its partners in the legal industry to help to build a future free from violence. “We are dedicated to providing a respectful and safe workplace for our team members and preventing violence against women in the wider community,” Ms Gaske said. 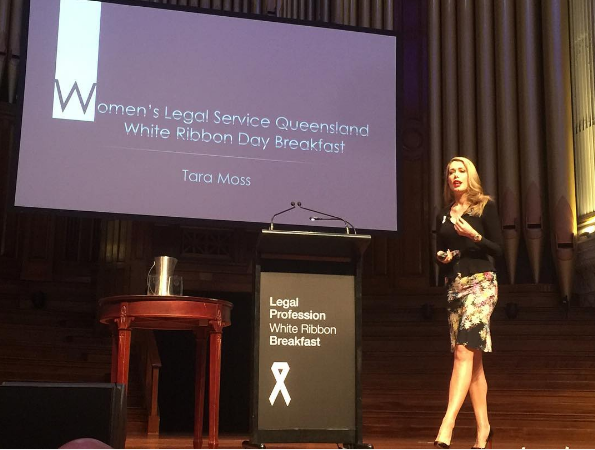 More than 770 legal professionals attended the White Ribbon Breakfast in Brisbane. Women’s Legal Service Fundraising Manager Natalie Davidson said today’s breakfast was its largest legal profession fundraising event of the year. “Auscript’s support at this event was incredibly generous and is immensely appreciated by Women’s Legal Service and the women we help,” Ms Davidson said. Auscript was also a major sponsor of the 2015 breakfast which raised $83,000 and enabled the Women’s Legal Service to start a new Help Line to assist thousands of Queensland women and their children who need free legal help regarding experiencing domestic violence and complex family matters.